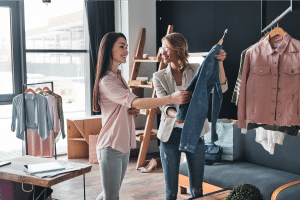 Could the evolution of U.S. retail stores into showroom-type spaces, whether operated by clicks-to-bricks retailers or mainline chains with advanced multichannel strategies, ultimately alter the traditional landlord-tenant rent structure? Consider some of the directions in which retail already appears to be headed. Tenants have long used retail locations to facilitate transactions. In this centuries-old model, a retailer shows potential customers its physical goods; the customer decides to buy; money changes hands; and the customer takes the purchase home. Logistics centers for product delivery and returns. These separate uses are now beginning to break apart. Inventory storage is becoming less and less essential at retail stores, an accelerating trend that began years ago as chains started moving inventory to warehouses located outside of expensive retail submarkets. The logistics function is being fulfilled by fast and efficient delivery services, such as same-day parcel companies, ridesharing delivery and, in pilot tests, even drones. And of course, the transactional component is increasingly handled online. What will remain at the end point of this disaggregation? Arguably, the best part of traditional retail—a satisfying customer experience enhanced by total brand immersion. Elements of the shift are visible even at big-box stores like The Home Depot, which no longer need to carry surplus inventory of bulky appliances and home furnishings. Instead of walking in to pick up a new dishwasher or area rug (and then try to find a way to get it home), customers touch and feel display models or view product photos while discussing specs with an on-site expert—all as a prelude to ordering online via an in-store system (or their own mobile device) for subsequent home delivery. For retailers, carrying less in-store inventory translates into reduced need for storage, shelf and floor space. Less “showroom inventory” allows shoppers to see a wider variety of merchandise within the same, easier-to-navigate store. It’s no longer strange to see showrooms at malls. Nobody walks out of a Tesla Motors showroom with anything more than a fond memory and perhaps a selfie. Traditional office tenants like Accenture could even justify taking retail space to create brand awareness among shoppers with the right demographics. Over time, this could lead landlords to pursue very different tenant rosters. Striking the right balance of diverse retail and non-retail operators could bring new challenges. No longer will this mean simply deciding between, say, clothing or electronics tenants, or between restaurants and home furnishings chains. Now landlords may need to decide whether new categories will complement existing retail, entertainment, nightlife and dining options. It is not hard to imagine, for example, some of today’s top Internet advertisers, such as Wayfair, Expedia or American Express, creating highly interactive and personalized spaces at retail and other properties. These quasi-storefronts would be wired with beacon technology, digital signage and even so-called “sentiment analysis” (essentially, using tech to understand customer mindsets and attempt to predict mood and behavior). Taking this next step will require landlords to look carefully at the customers of each tenant and the ways in which those customers spend their time, not just their money. Some retail REITs are already starting to do precisely this when chasing deals with clicks-to-bricks retailers where marketing data plays a prominent role from the outset. On the landlord side, the idea is to collect dramatically more and better customer and property data and then share this with tech-savvy tenants. Owners are tapping location-enabled mobile apps, shoppers’ (anonymous) cell signals, AI-driven cameras and other data pools. Reciprocally, digitally native retailers could also share their voluminous data (clickstream data, browse and purchase history, per-page dwell time and more) with landlords, deepening the symbiosis. If this model proves successful, other inline tenants will surely follow suit. For properties in the best markets, that could mean an increase in smaller-footprint stores focused on experiential sales and marketing. The net effect? These high-traffic properties could become important influencers in the eyes of tenant marketing teams. This, in turn, could create incentives to carve out budgets geared toward using retail real estate to bolster the brand and win customer loyalty—and new customers altogether. THE END OF PERCENTAGE RENT? Under this scenario, functions such as inventory storage, transaction-processing and logistics will be lower-profile, or even absent, among a growing subgroup of tenants. Instead, the focus will be on leveraging experiential marketing to capture what these operators wanted all along: more customers. This could lead to some radical changes in which tenants occupy premier locations based on considerations related to traffic and customers rather than sales-per-square-foot. The advantage here: Landlords are already exploring ways to handle percentage rent in an era in which pinning sales to specific locations can be tricky, if not impossible. This new approach represents a potential solution. Tenants may find themselves focused less on getting customers to “buy now.” Instead, the goal would be to introduce potential customers to brands or deepen existing relationships. Freed from mundane tasks like running registers or stocking shelves, high-touch brand ambassadors could focus on providing the kind of personal service today’s consumers covet and that creates true long-term value. Eventually this shift could be a game-changer for retail rent structures, as well as current underwriting practices for investors and lenders. What could that look like? In the Software as a Service (SaaS) world, in which third-party providers host customer apps online, marketers almost always pay more for each new customer than the revenue they generate from a first-time sale alone. If this type of pricing were to pervade retail real estate, the entire concept of a rent-to-sales ratio would be upended. Imagine leases priced, not based on dollars per square foot or percentage of sales, but instead on the Cost to Acquire a Customer (CAC) or even on a price-per-lead basis, whereby retailers literally pay for just the footsteps into their stores. Retail rent structures could eerily resemble Pay-Per-Click advertising, allowing tenants to leverage typically “online only” tactics like customer retargeting. Keep in mind, virtually all businesses have online ad budgets, and extending this concept to non-retail industries could eventually lead to leases that broadly mimic traditional marketing agreements. If so, there could be a surge in demand for retail space, no longer the domain of the purely transactional consumer. This is not to suggest that the entire retail landscape will be transformed at once. The shift would likely start at leading-edge tenants located at the highest-profile properties. Places like Westfield Century City in Los Angeles, which just underwent a $1 billion redevelopment, draws huge crowds and is a celebrity hotspot (with its own elevator for VIPs) seem like locations ripe for this concept to take hold. Regardless of the timeline for such an evolution, the potential consequences are worth considering now. If American retailers continue to move toward wired, experiential showrooms, the change is bound to have lasting implications on site selection, design, traffic patterns, investments and, ultimately, rent.